Shaken! But there are times when it is neither, especially when you long for a nice martini and find out that you have neither vermouth nor olives. I needed a stiff drink yesterday. At around 10pm the heat to the second floor still wasn't restored, and it would be another half hour until that happened. 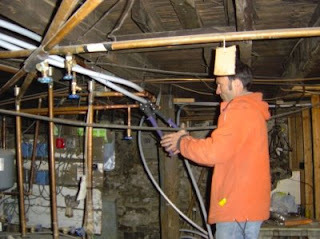 Yesterday I did the plumbing for the second floor heat, and as expected it didn't go as planned. I picked the most difficult spot first: soldering in a tight corner with the potential to burning down the house. Well, the house didn't burn down, but the pipe wasn't soldered together either, because there was too much water in the pipe, which prevents the pipe from heating up enough for soldering. This first setback sent me into a trance like condition. I needed some success, so I proceeded to work on the other areas that required soldering. After that worked well, I returned my problem spot, and found a solution. At 4pm I had completed the soldering on the second floor. 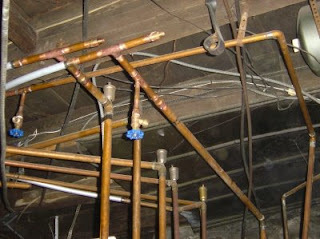 Off to the basement, cut the return pipe and solder on the T-piece I had prepared on Monday. On to the supply pipe. I had been suspicious about it all day, because the drain valve had continued dripping all day. I was not to be disappointed. Turned out that the shutoff valve for the supply pipe shut off the water only mostly. Water kept trickling out of the supply pipe. No way I could solder anything to that pipe. After a few moments of mental roller coaster riding I decided to leave the pipe dripping, put a bucket underneath, and simply use a different pipe for the hot water supply (we have five heating zones, of which two are disconnected right now, as I am waiting for the radiators to come in). At 8:30pm the system was ready for lift off. I open the valves to fill the pipes, when in a sudden water came gushing from the old return pipe. #@&$!!! I had completely forgotten to cap off the old return pipe. After getting parts and more soldering, I was ready to give it another try. That was shortly before 10pm. Open the floodgates and whoosh, more water. Turned out that one of my T-pieces wasn't soldered together as well as one wishes. #@&$!!! I knew the whole day, that I was going to reward myself with a nice martini, after I finished this project, but now I couldn't wait any longer. Poured, not shaken or stirred! At 10:30pm, at long last, I opened the valves and the water stayed where it was supposed to stay, in the pipes.